A man walks toward the State House in Augusta, Feb. 11, 2019. 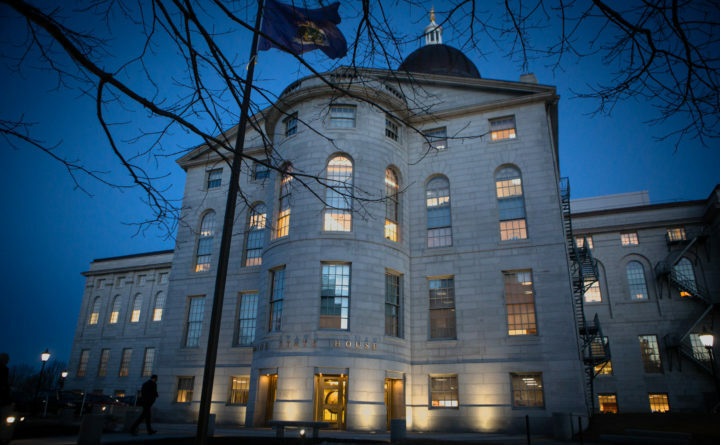 Last November’s elections brought some dramatic changes to Maine’s Legislature and the Blaine House, which have resulted in a number of new directions in state policy. But something that didn’t change after the votes were counted was how we approach home care for older adults, provide support for family caregivers, or improve work conditions for home care workers. In November, voters soundly defeated Question 1, which would have addressed these issues. The arguments against the “Homecare for All” citizen’s initiative were primarily focused on how the program would be financed and implemented. Some also argued that policy is better made through the legislative process, which allows discussion, debate and compromise. But no arguments challenged the urgency of the problems the initiative sought to address. During the campaign for Question 1, numerous legislators stated their concerns about voting in favor of the initiative, while saying that they were committed to the cause of providing better care for Maine’s aging population. Now that the legislative session is in full swing those elected officials have an opportunity — and a responsibility — to make good on those commitments to tackle three critical issues regarding home care. First, we know that Maine’s population is aging, and with older age comes increased likelihood of functional disabilities that require assistance. Estimates project that one quarter of Maine adults 65 and older will require at least one year of paid support as they age. In Maine, the cost of 30 hours per week of home care for one year is roughly equivalent to the median household income for older adults, and thus out of reach for most Maine families. Second, given these high costs, it is not surprising that family caregivers provide most of the assistance received by individuals needing help to stay in their homes. In 2013, an estimated 178,000 family caregivers in Maine provided 165 million hours of unpaid care valued at $2.2 billion. While many family caregivers do not identify as such, their actions allow their parents and grandparents to live in their own communities. This caregiving has consequences for the caregivers, such as fewer hours available to work for pay, reduced retirement benefits and potential adverse health outcomes. The third issue that desperately needs to be addressed is the challenge of recruiting and retaining home care workers. Despite being one of the fastest growing occupational groups in Maine, the supply of workers has not been keeping pace with the demand for services; approximately 6,000 hours of home care need in Maine went unstaffed each week in 2017. My own research has found that Maine home care workers enjoy their work and are committed to their clients’ well-being, but low wages, inconsistent hours, unreimbursed mileage, lack of benefits and few opportunities for advancement cause many to leave the work they love. We know that better pay and benefits will improve recruitment and retention, grow the home care workforce and, ultimately, benefit Maine’s economy. The Legislature’s Committee on Health and Human Services has heard a host of bills related to long-term services and supports over the past two months. The problems are well known and have been well studied. Not unlike climate change, what was once just a challenge is now a crisis — further delay on decisive action will affect our families, neighbors and friends. It is imperative that our newly elected Legislature and governor, in cooperation with the new leadership of the Department of Health and Human Services, make solving the problems of inadequate access to home care for older adults, lack of support for family caregivers and poor job conditions of home care workers a priority now. It cannot wait. Sandra Butler is a professor in the School of Social Work at the University of Maine in Orono. Her views are her own and do not represent those of any group with which she is affiliated. She is a member of the Maine chapter of the national Scholars Strategy Network, which brings together scholars across the country to address public challenges and their policy implications. Members’ columns appear in the BDN every other week.